The Healthy School Food Collaborative is one of the largest Sponsors of Summer Food Service Programs (SFSP). Working with State Agencies and Summer Food Program Sites, the HSFC makes sure that free, healthy meals are available in the summer when school is not in session. 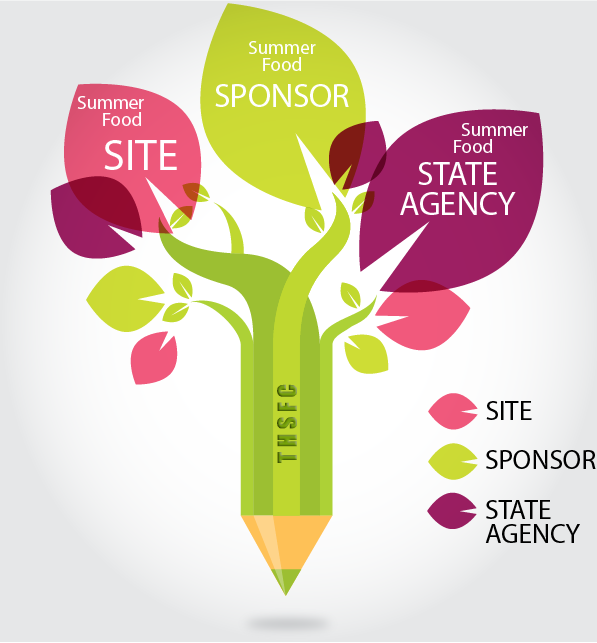 There are 3 main components to a summer food program - Sites, Sponsors and State Agencies. The HSFC is a Sponsor who assists sites by working with state agencies to coordinate a summer food service program. Summer Food Program Sites, Sponsors and Agencies? Summer Food Service Program (SFSP) Sites may be schools, parks, community centers and churches or a location where children can receive meals in a safe and supervised environment. Sites work directly with Sponsors. Sponsors are organizations that have the ability to manage a food service program. Sponsors enter into agreements with State Agencies and receive reimbursement to coordinator and sponsor the program. Summer Food Service Program Sponsors may manage multiple sites. State Agencies are responsible for communicating with the USDA about summer food service program sites. They also work with individuals, schools and community organizations to connect families to free summer meals. What We do for You . .